What defines a sustainable food system? How can it be more inclusive? How do local and global scales interact and how does power flow within food systems? How to encourage an interdisciplinary approach to realizing sustainable food systems? And how to activate change? These questions are considered by EU and North American academics and practitioners in this book. 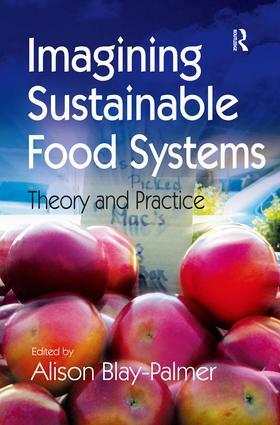 Using a wide range of case studies, it provides a critical overview, showing how and where theory and practice can converge to produce more sustainable food systems. Contents: Part 1 Interrogating Sustainable Food Systems: Imagining sustainable food systems, Alison Blay-Palmer; Conceptualizing and creating sustainable food systems: how interdisciplinarity can help, Clare Hinrichs; Sustainability: a tool for food system reform?, Mustafa Koc. Part 2 Inclusion and Exclusion in Sustainable Food Systems: Greening the realm: sustainable food chains and the public plate, Kevin Morgan; Thinking about labour in alternative food systems, Yael Levitte; The urban food desert: spatial inequality or opportunity for change?, Ellen Desjardins. Part 3 The Case for Sustainable Food Systems: Food systems planning and sustainable cities and regions: the role of the firm in sustainable food capitalism, Betsy Donald; The nexus between alternative food systems and entrepreneurism: three local stories, Hélène St. Jacques; Scaling up: bringing public institutions and food service corporations into the project for a local, sustainable food system in Ontario, Harriet Friedmann; Food policy encounters of a 3rd kind: how the Toronto Food Policy Council socializes for sustain-ability, Wayne Roberts; Food insecurity in the land of plenty: the Windermere valley paradox, Alison Bell; Imagining sustainable food systems: the path to regenerative food systems, Alison Blay-Palmer and Mustafa Koc; Index.